Over 20 years ago I read the poem by Emily Dickinson, “Some keep the Sabbath going to church.” I always like Emily Dickinson. They said she was an introvert and that many of her poems were written on scrap pieces of paper. She reminded me of myself because I write quick whimsical poems often about nature or my deepest emotions. For many years, I did not value myself as a writer because inspiration hits me like a bolt of lightening. Then, the words flow quickly and effortlessly. I thought I didn’t put enough time into it for it to be valued. However, as I continue with my spiritual journey I realized that my sporadic and whimsical writings are my signature and style. Now, I can appreciate the way that I write as a form of self-acceptance and uniqueness. I hope that–unlike Emily Dickinson–people will read my poems while I am here, for it is the present moment that holds the power. 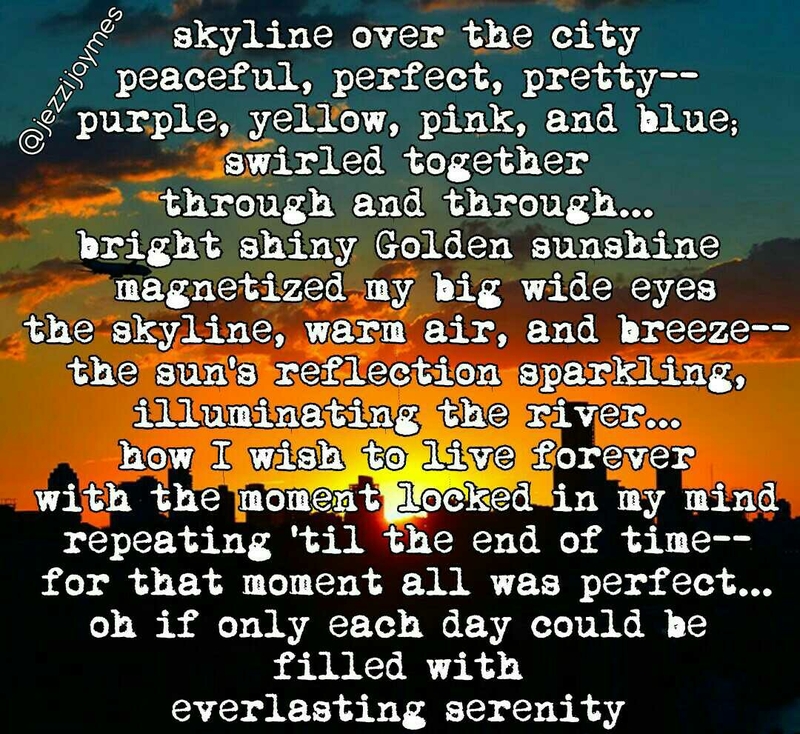 This entry was posted in Journal Entries, Visual Poetry and tagged city, infp, nature, nature lover, poem, poet, poetry, sunset, words, writer. Bookmark the permalink.